Your post-work years are a time to improve your golf game, take up a new hobby, or just enjoy a well-deserved break. In these great college towns, you can expand your intellectual horizons too. 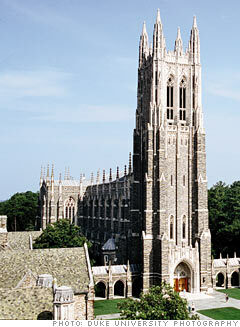 Durham would rank as a retiree Mecca even without Duke University's stellar lifelong-learning program. Residents enjoy four seasons -- but without them being too extreme. Homes are affordable, the area is dotted with golf courses and parkland, and the region is home to a renowned university medical center. This former tobacco town also is a budding cultural haven. Duke's Nasher Museum of Art has a growing contemporary art collection. Concerts and Broadway hits, such as Billy Elliot and the Lion King, frequently make their way to the newly built 2,800-seat Durham Performing Arts Center. Duke's 33-year-old senior learning program is one of the largest in the country, with more than 1,500 members. There are 100-plus courses offered every term, covering topics from Introduction to China to Alexander the Great. Plus, because most courses are offered on campus, members can mix with the younger generation in the student center, libraries, and dining halls. Data sources: OnBoard Informatics, MDA DataQuick, National Association of Realtors, Tax Foundation CCH, a Wolters Klower business. Home prices as of Q2 2010 unless otherwise noted.